7:45 AM: Happy New Year! It's been a few days since we posted an update, so I thought I'd pop in and let everyone know that we're doing fine. I took Elisabeth to Urgent Care on Saturday, and the doctor said she did not have the flu (test came back negative), but he heard some congestion in her chest, so he put her on antibiotics and suggested an expectorant. She continued to have very high fevers (she said it was 105.6 one time she took it, but we didn't see it for ourselves), but she's definitely feeling better now. Still lots of head congestion, but no fevers since Sunday. Sophie doing fine too. Randall and I are feeling mostly fine, but I think we're ready to get back to our normal routine. Having so much time together as a family was wonderful but exhausting! We visited with friends (local and visiting), and we took the girls to three movies (Charlotte's Web, Eragon, and Happy Feet). It's nice that Sophie's at an age where she can enjoy movies. Our last hurdle for the season is getting our Christmas cards assembled and mailed. We have our list, the labels are printed, we've drafted the letter, and we've had copies of a picture of us from Disney printed. Now we just need to sit down and finish the job! 12:00 PM: Sophie was scheduled for her monthly treatment this morning. No spinal tap this time (just vincristine), so she and Randall didn't have to leave at the crack of dawn. He just called to say that everything went great. We've been talking to Sophie a lot about the blood draws and how to make them more comfortable and less scary. One of the nurses had suggested last time that she try to relax, which helps the blood flow better, so we spent a lot of time showing her how to tense up and then relax. She had a lot of fun with that. This morning, we talked through what would happen and developed a whole plan for how things would go. Randall said she was fine until they called her, and she was just going to go play in the play room, so she was immediately upset about the change in plans. She screamed and cried all the way into the room where they do the draw and was really agitated, as usual. When Mary (the nurse) sat down, Randall told Sophie that they should explain to Mary everything they had talked about and how they wanted to do things. 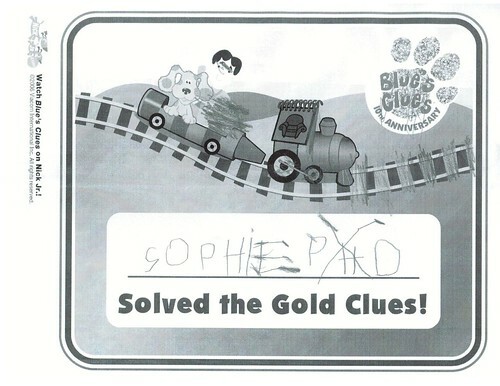 So, as they started to talk about picking out a bandaid before getting started, and that Sophie wanted to do it slowly, and she wanted to watch, etc., Sophie really started to calm down. From that point on, she held still, didn't cry, watched every move Mary made, and did really well! When I talked to her on the phone, she told me she was shaking a "little bit" but next time she wouldn't be so scared. I'm starting to think we just might get to the point where blood draws are no big deal. Her counts weren't back when they left, but the doctor said he had no reason to think they would be low and would call us when the results were in. If her counts are high enough, they'll bump up her dosage from 50% to probably 75%. Randall also had a nice meeting with Dr. Gold, our primary attending physician (we always meet with a doctor or nurse practitioner before getting treatment). Randall had a few more questions about how things will go at the end of treatment. We had learned during our last discussion with him that all chemo ends on May 31, and they schedule a bone marrow and spinal fluid aspiration for two weeks later. Unfortunately, that's right around the time we need to be leaving for New Mexico (I'm sort of in denial about that, since I'm torn between staying and leaving). Anyhow, Dr. Gold said we would just schedule the aspirations for June 5--a sedation day in the clinic (which means we don't have to schedule a procedure in the main hospital). That gives us a lot more flexibility for moving, and we won't be so worried about the results. She hasn't had her bone marrow checked since February of 2005, so we're eager to know that everything is okay. Meanwhile, Sophie's headaches seem to be all but gone. She'll continue another week of clindamycin, but Dr. Gold said we could try stopping the flonase (which she handles really well--you ought to see her!). Elisabeth and Randall both seem to have recovered from whatever they had. I, however, am still suffering with something. Lots of head and chest congestion, and it's starting to make my asthma kick in. If this is anything like past illnesses, I'll probably be sick for weeks on end, until I get some really strong antibiotic or steroids. Speaking of steroids, Sophie started her five-day course this morning, so please send positive thoughts our way. We never know how bad her mood or appetite will be. Let's hope this is an easy month. 9:00 PM: The clinic called with Sophie's counts, and everything looks great. In fact, I don't think her ANC has ever been this high (8.6). That's a good indication that she can tolerate more chemo, so they have bumped up her dosage. She'll go in for another blood test on the 17th to make sure the ANC is above 1.0, which is the target. The girls have had a great evening together. At the moment, they're both in bed in Sophie's room, talking and laughing. I won't worry too much about making them be quiet and go to sleep--maybe they'll sleep in! 7:53 PM The girls just got out of the bathtub and are (very slowly and very loudly) picking up and getting ready for bed. Sophie and Elisabeth both finished their course of antibiotics this week, and they seem to be doing well. Sophie will go to Chapel Hill on Wednesday for another blood draw to see how her counts are doing after the latest increase in her chemo dosages. We're assuming that all will be fine and she will be able to "bump up" to her regular dosage levels. Honestly, it's tough keeping up with all of it--half tablets one night, whole tablets the next night, etc. Thankfully, Susan is more organized and on top of these things than I am. She usually does a chart on Mondays that lays out the whole week. If there's any doubt about what we're supposed to be giving Sophie, between the two of us we can usually figure things out. Cute Sophie story. The girls got Barbie in the Twelve Dancing Princesses for Christmas and the main character (played by Barbie, of course) is named "Genevieve," only Sophie cannot say her name for some reason and calls her "Genebeef" instead (although sometimes, she calls her Genebeaver"). She is an endless source of laughter in our family! Just a brief post to give everyone an update. 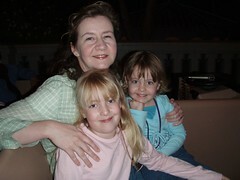 Sophie and I will go up to Chapel Hill tomorrow (Wednesday) for yet another blood draw. The doctors will want to check her counts following the latest increase in her chemotherapy dosages. Unfortunately, Sophie has started coughing and has a bit of a runny nose, so clearly she is working on something. My primary concern is that yet another increase in dosage combined with an oncoming infection will cause her immune system to weaken even further. Depending on what her counts look like tomorrow, I'll at least suggest the possibility that we hold off on another increase in the dosage until her next treatment, which is in two weeks. I know that the drugs are very, very important to keeping the leukemia away, but I also know that we are trying to maintain a delicate balance here. That balance seems to get disrupted pretty easily whenever Sophie has an infection and increases in her doses. We'll see. Other than that underlying concern, everything is going very well. Both girls are happy and healthy and have enjoyed spending lots of time together lately (no school, etc.). I took both of them to see "Happily Never After" yesterday--we've been quite the movie hounds lately haven't we? I would rate "Happily Never" at the bottom of our recent movie experiences, but it was fun getting out of the house with the two of them. 10:44pm Sophie did so well at the clinic today. We asked for a "two minute" warning ahead of time, so we could emotionally prepare for the blood draw, and Sophie was awesome for the first two "sticks." Yeah. I said "the first two." Unfortunately, it took three sticks, and the third one was a bit of a challenge. I could not believe how calm and still Sophie was (she seems to like to watch being stuck with the needle) for the stick on both hands. She squirmed and complained a little bit, but the nurses and recreational therapy person got her talking about her Make-A-Wish trip and that was distracting enough to keep her calm during the first two attempts to draw blood. After the first two pokes did not work, the nurses gave us a couple of warming pads to plump up the veins in her hands. The third poke was not as easy, by far (better than some), but it was the charm. All in all, I was so proud of her! On the way back from the clinic, we ran some errands (had lunch, I got my hair cut, etc.). She did mostly well with all of that, but ended up throwing up (twice) in the car on the way home. Fortunately, she gave me enough advance warning that I was able to dump my drink cup from lunch and she ended up throwing up in that. Honestly, I was amazed that she was able to reach for the cup and throw up in the cup every time. This is one kid who will definitely be in touch with her body and knows what is going on with her body! She was pretty out of it for the rest of the evening, but seemed to perk up some in the evening. We cannot tell if it is just a stomach bug, a bad reaction to something she ate, or something else. Hopefully she'll rebound quickly and all will be well. The news from her blood draw this evening was mostly good--her counts are really, really high, so we're going to bump her chemotherapy up to about 95%. I know that last night, I was reluctant to bump given the upper respiratory thing she has going on, but we'll give it a shot. She goes back in two weeks for treatment, so we'll get a check on her counts then. If the drop has been too low, then we'll go from there. Let's hope that Sophie recovers from her stomach bug and her upper respiratory issues, is able to tolerate the higher dosages of chemotherapy (not something we are terribly worried about) and can maintain a strong immune system through it all. 10:30 PM: Sophie recovered just fine from her stomach bug and has been doing very well--happy and healthy. The same can't be said for the rest of us, though. In the middle of the night last night, Elisabeth started throwing up and having diarrhea. After we were both up and down helping her, Randall finally slept on the floor next to her bed so he could be nearby. She was very sick and miserable all day (and we did lots of laundry), but she finally seemed to have things under control by around 7:00 tonight. Unfortunately, that was around the same time that Randall started feeling terrible. He could tell he was headed for trouble, so he called some folks from the church to let them know he might not be able to lead worship tomorrow. He started throwing up a half hour ago and seems to feel better for now. I am really hoping he gets the version Sophie had, since it seemed fairly short-lived. As you can imagine, I am being very careful to wash my hands and use sanitizer. As hectic as things are at work for me right now, I can't afford to lose a day. And one of us needs to be healthy to take care of everyone else! 8:30 AM: Well, I guess I can add "preacher" to my resume. Randall was too sick to go to church yesterday, so I preached his sermon! Someone else from the congregation led most of the service, and I did the scripture readings and the sermon. Amazingly, I wasn't the least bit nervous (I usually am with public speaking). It's easy to work with his words, and somehow I guess I was less nervous about reading his words than being judged by my own. I managed to make a fair amount of eye contact and not get lost, and people said it didn't seem like I was "reading" at all. I don't want to make it a regular event, but it's nice to know that I can do it when needed. Just don't ask me to write the thing! Because I have a long day planned at work today, and Elisabeth is out of school, I arranged to have the girls spend last night and today with friends from church so Randall can recover. He's starting to feel better, but even as late as last night, he was still feeling very queasy. He seemed to have more energy this morning. No signs so far that I am going to get sick. 1:02 PM I realized a day or two ago that we had passed the two year anniversary of Sophie's diagnosis without even mentioning it. In fact, I only realized it after the fact. As long as I live, I'll remember that January 21st was the day we rushed Sophie to Chapel Hill, uncertain about what the problem was, but absolutely certain that it was something awful. It's like a second birthday, almost. A day to remember. Sophie is doing well. She seems to be okay with the increased chemo dosages, although she goes in for treatment next Friday and we'll get another blood draw then to find out exactly how she's handling the drugs. I can report that we are all (mostly) healthy, at least compared to last weekend. I ended up going to the doctor on Wednesday and was diagnosed with an ear infection (who knew grown-ups get ear infections?). We're very proud to report that Elisabeth is doing very well in school. Her grades on this last report card were even higher than last time. We also got (finally) the second half of her 3rd grade pretest. The reading portion came back in the fall, which showed that she was in the 91st percentile of all kids taking the test in previous years. The math portion just came back and was even better. Elisabeth scored in the 97th percentile of all kids taking the test this year (this is the first year of testing in math for 3rd graders). I knew that her reading was strong, but I had no idea that her math was going to be that good. Given how few girls end up excelling in math and science, this is encouraging news for Elisabeth.